A green tea strawberry smoothie is not only great for a quick breakfast – it also works great as a popsicle recipe! Like my chocolate banana smoothies, these also made great popsicles for our backyard movie night! The trick to a great smoothie is a combination of fresh and frozen fruit. 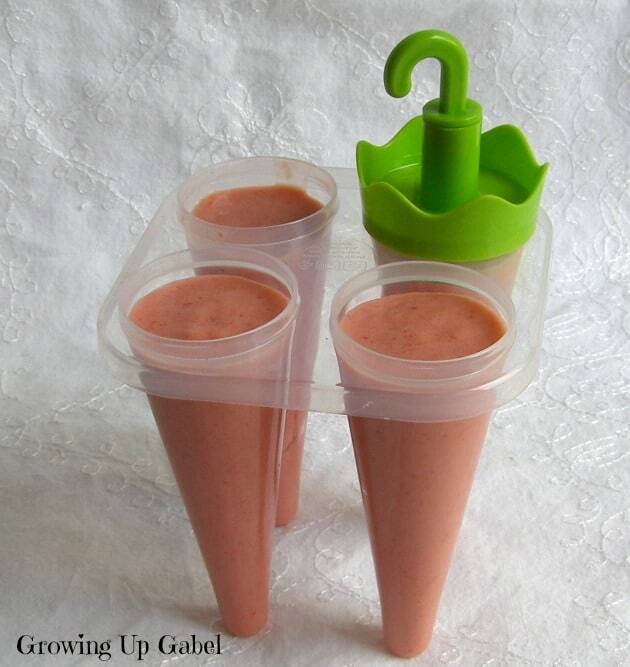 For this strawberry smoothie, I added in pomegranate green tea ice cubes for a healthy boost of antioxidants. 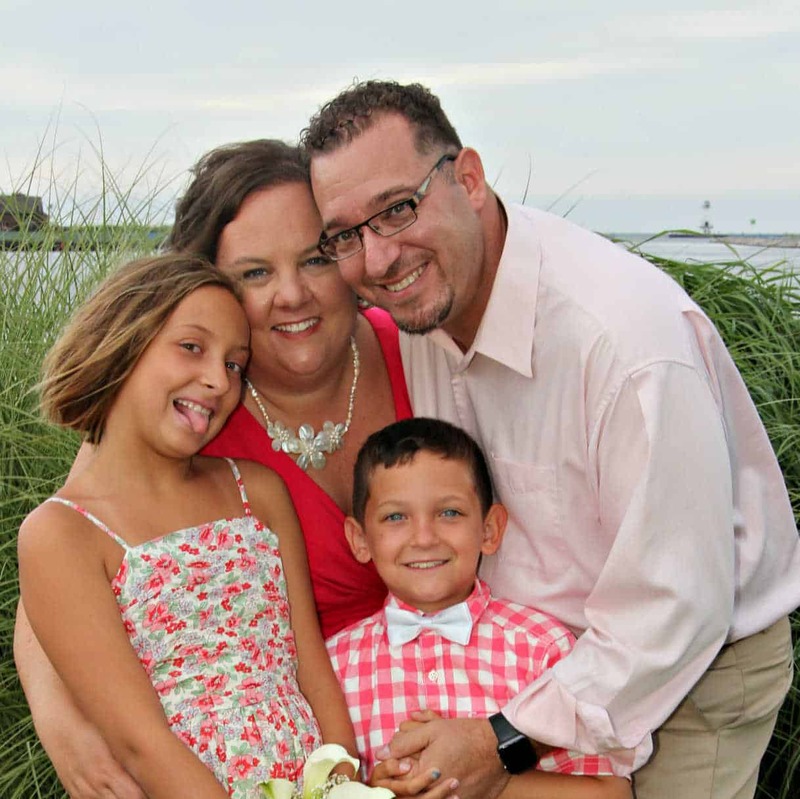 My kids are a little weird – they don't like smoothies. After months of throwing away leftover smoothies, a friend suggested I freeze them and make popsicles. Well, duh! It worked like a charm and my kids now eat healthy popsicles without batting an eye. So when I wanted to make a fun frozen treat using tea for our backyard movie night, I pulled out the popsicle molds. You can really use any tea or fruits that you want. 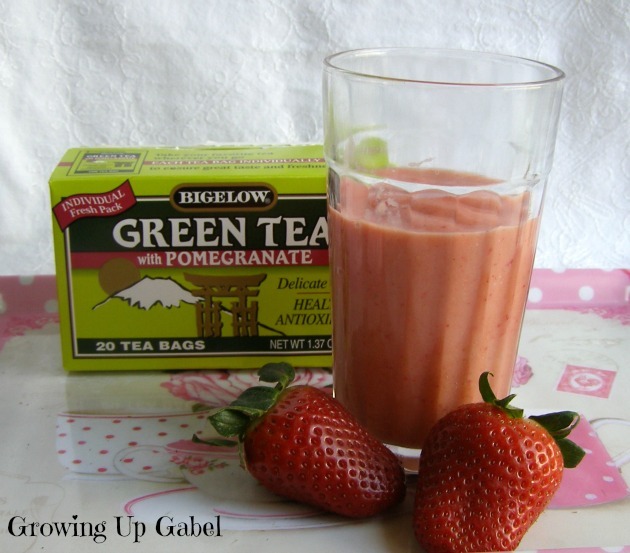 I opted for Bigelow Tea's pomegranate green tea because I wanted to try a green tea smoothie. I did not realize, however, that green tea is caffeinated. 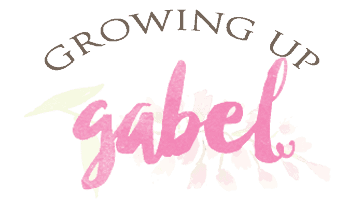 So if making the smoothie in to popsicles for kids, you may want to go with an herbal tea and Bigelow does have a Pomegranate Pizzazz herbal tea. I used fresh strawberries and frozen peaches because that's what I like in my smoothies. I don't like bananas in them at all! But anything will work. My little trick was to freeze the tea in to ice cubes first. I made the tea, let it cool, poured it in to ice cube trays, and froze it. I put the extras in a plastic freezer bag for later. Then I layered the ingredients in my blender and blended away! Put the ice cubes and frozen fruit on the bottom, though, as they blend up better that way. After I enjoyed a smoothie, I poured the rest of the batch in to some popsicle molds and threw them in the freezer. 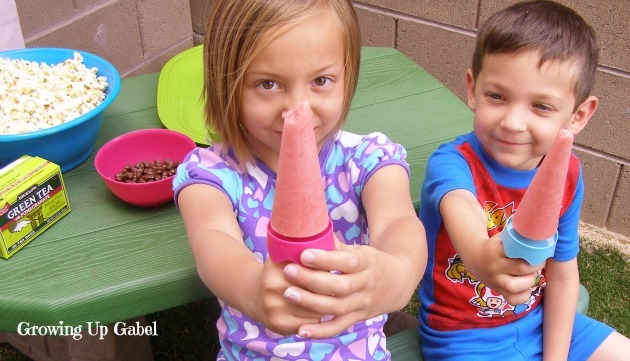 A fun frozen, and healthy, treat of our backyard movie night! These weren't overly sweet and were very fruity. If you wanted a little more sweetness, try adding in a dash of orange juice or using vanilla yogurt. 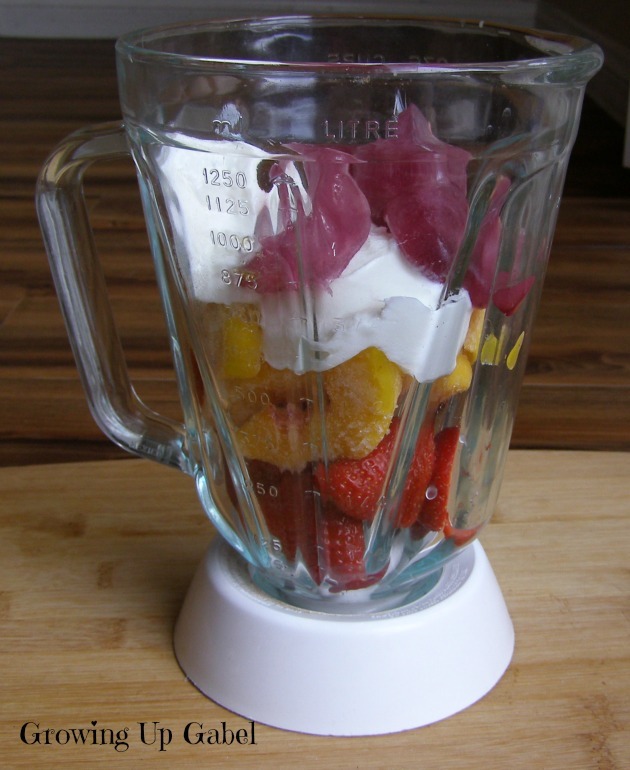 Put all ingredients in a blender and blend until smooth. I recommend putting the ice cubes and frozen fruits in first for better blending. 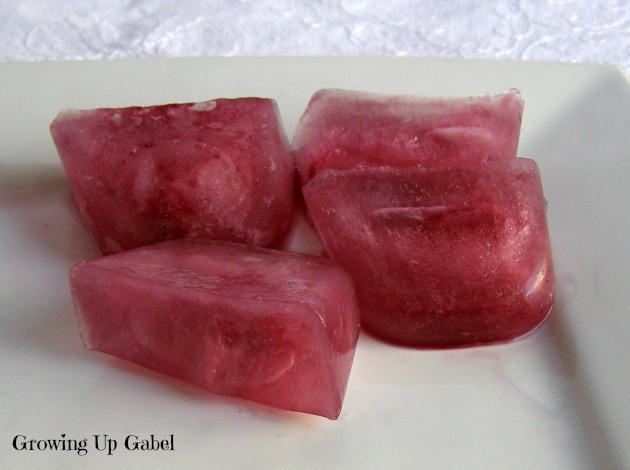 Pour smoothie in to popsicle mold and freeze. Awesome recipe idea Camille! I have done a few popsicle recipes, but none like this. It looks delicious! Thank you! The kids drink the smoothies more now but we still get lots of popsicles. I love the popsicle idea I will try those. They are great! My kids are more used to eating smoothies now so I don’t get the chance to make popsicles as much! These sound so refreshing! Love the mix you used. Anything with Green Tea is good in my book 😉 Thanks so much for sharing with us at Weekend Wonders! Hope you’re enjoying your week so far. These pops look absolutely delicious! I’m definitely going to try making these. I found you though the Gooseberry patch smoothie recipes. Thanks for the tip on freezing them! My children don’t like smoothies either, which always surprised me since they really love fruit. I think they would love them in popsicles though and I am going to give that a go. I also love how you put green tea in your smoothie. I drink a cup of green tea every morning. Now that the weather is warming up, I think I need to make some ice cubes and put them in smoothies. Thanks again for the tips. Have a great Sunday!